After a long, cold winter, spring brings a welcome change in temperature and brings us closer to hot summer days. Our pools have lain dormant all through the cold season. To have them swim-ready by summer, it takes a little work and planning. Opening up the pool for summer requires a few days’ worth of work. It won’t take long for the kids to start asking, “Mom, is the pool ready yet?” Minimize the wait and save your sanity. Start the process now before the water’s warm enough to dive in. Here’s how. First of all, don’t procrastinate. When the temperature rises above 51 degrees F, algae spores that lay dormant over winter begin to grow. A big algae bloom can happen within a few hours. Chemical imbalances, sunlight, and organic matter will make them grow even faster. Cleaning out the algae will cost unneeded time and money that can easily be avoided. Know the weather patterns for your local area. When the thermometer consistently remains 51 F and over, it’s time to start pool prep. Set a date for opening the pool, preferably a weekend or a few days when your schedule is light. Purchase all your supplies, including chemicals and test kits. Check all your pool cleaning tools. If anything needs to be replaced, such as a skimmer net or pool vacuum, purchase those now so they’re ready to roll. Tip: Check out our reviews to find a top-rated pool vacuum you can count on. Prune shrubs, overhanging tree limbs, flowers and other plants so they’re not hanging over the pool. This will minimize algae spores and debris from falling into the pool. A week or so before the planned opening, remove your pool cover (you have one, right?). If not, invest in one NOW. Clean all the loose debris off first, plus any standing water. Hang it up to dry somewhere out of the elements. When it’s totally dry, fold and store away in a cool, dry place until swim season’s over. Take a look at the pool construction. Whether you have an inground or above ground pool, check for any cracks, loose tiles, stains, splits, tears, or anything that could get worse from the strain of water flow and swimming. Now’s the time to get it fixed. Do. Not. Empty. The. Pool. You do not need to empty the pool unless it’s an emergency situation. Examples: Any major structural work or algae growth that is too thick for you to handle. Emptying the pool just to refresh the water can cause damage. If your pool is built on dirt with a high water table, it can actually lift out of the ground without the weight of pool water to hold it down. 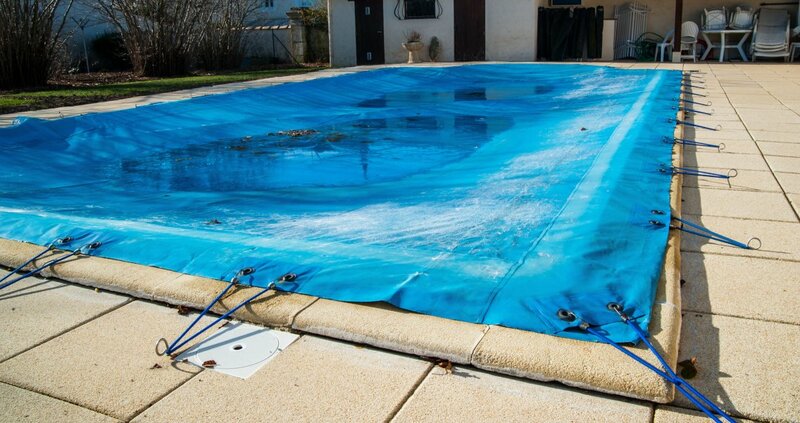 The best way to keep your water clean over the winter is…you guessed it – a good pool cover! Check your pump and filter for damage and dirt accumulation. If you have cartridge filters, look closely at the cartridge element and O-rings around the cap. Replace if needed. For sand filters, you need to backwash them. Using new filter sand is even better. For other small filters, clean or replace the mesh. Inspect the pump, open up valves, remove plugs. Start the pump and check for any leaks. Look at the pressure gauge. You should see bubbles around the pool returns. 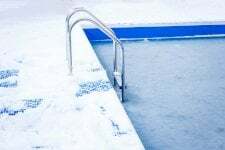 It’s normal for pools to lose some water over winter, so if needed, top it off with fresh water. You’ll need the proper volume in order to get the chemicals balanced out. With the pump running, vacuum the pool. If you have a good pool cover, debris should be minimal. Brush down the sides, steps, and ladders, making sure to get into the corners and behind things that the vacuum can’t reach. Let the pool pump circulate water for at least 24 hours to filter out the loose dirt. Clean out your filter cartridges and baskets a few times during this step. If you’re looking for a dependable pool vacuum, read our reviews of some of the top-rated models on the market! Running the pump for a full day will help you get an accurate reading when you’re ready to test the chemistry. One option for this is to take a water sample to a local pool store. They will often test it for free to measure minerals, pH and chlorine. While you’re there, you can stock up on test strips and any items you need for your testing kit. pH level – 7.2 to 7.4 To increase, use soda ash. To decrease, use muriatic acid or sodium bisulfate. Total alkalinity – 80 to 120 To increase, use sodium bicarbonate (baking soda). To decrease, use muriatic acid. Calcium – 150 ppm to 250 ppm If the water is too “soft” (not enough calcium), use calcium chloride to increase it. Chlorine – 1 ppm to 3 ppm Add liquid or granules to bring it up to normal levels. You may need to add more chlorine over the next several days to keep it at optimal levels. Tip: Try installing an inline plastic chlorinator or buy some cheap floating chlorine dispensers to maintain levels. Once the water is nice and clear and the chemicals are living in harmony, you’re ready to swim. This could take a week or more. Keep your pool maintained by cleaning filters regularly and vacuuming at least once a week. Try to test your chemicals every day if possible, but at least a few times a week. If you keep your pool clean and the chemicals balanced, you’ll be able to enjoy a long season of swimming fun!